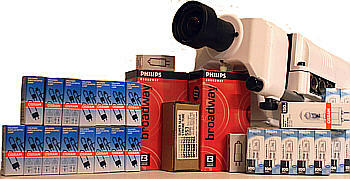 We only supply the finest halogen and HID lamps from brands such as Osram, Philips and GE. Please observe handling precautions for lamps as otherwise premature failure can occur. Note that LED projectors such as the Solar 100 LED, Solar 250 LED and OPTI Aura don't need spare lamps! If you suspect yours does, do not attempt to open/repair the projector as this will affect the warranty - please contact the supplier of your projector. LED projectors should not require new LEDs for years, if ever.